From Blank Out, at the Park Avenue Armory. Opera is never more dynamic than when it is not quite opera. The genre is constantly dissolving and reappearing in some new hybrid of voices, images, and music, and three recent New York premieres act like Muybridge stop-motion photos of this fast-moving art form. The most deceptively traditional is Crossing by Matthew Aucoin, a deliberately beautiful portrait of Walt Whitman tending wounded soldiers during the Civil War. At the radically revelatory end is Michel Van der Aa’s Blank Out, in which a lone singer moves among the stage’s space and, virtually, through a miniature model of a house. Past and present, live and electronic sound, present and imaginary characters, two- and three-dimensional worlds — all interweave in a surreal tapestry of illusion. In between lies Jonathan Berger’s My Lai, a monodrama written for tenor Rinde Eckert, the Kronos string quartet, and traditional Vietnamese instruments played by Vân Ánh Võ. That piece looks back on a wartime episode from the claustrophobic confines of a dying veteran’s hospital room. There are thematic and technical threads that unite these works: the ever more seamless use of video, the relentless probing of trauma, the confessional soliloquy, and the art of intimate spectacle. All three composers cherish the voice, in all its mercurial splendor. And yet they point in three cardinal directions: Crossing toward the emotional richness of the concert experience, Blank Out toward the high-tech merger of music and virtual illusion, My Lai toward a global fusion of styles. Aucoin was only 25 when he conducted the world premiere of Crossing in Boston two years ago; now, he conducts its first outing at BAM, and the opera sounds miraculously like the product of long experience. Age and youth collide onstage. We encounter a gray-bearded Whitman surrounded by soldiers who are barely out of childhood. Yet the kids have absorbed damage and faced death, while the old poet has more questions than wisdom. Aucoin depicts Whitman as a disoriented prophet, trying to bring comfort and sowing pain, clumsily rooting around in other people’s suffering. What’s missing is the man’s exuberance, the muscular, childlike delight that sharpened his sense of tragedy. Whitman threw himself into the physical world, in burgeoning cities, raucous crowds, rich voices singing sensual music, and, as a Civil War nurse, in the realities of ripped flesh and crushed bones. 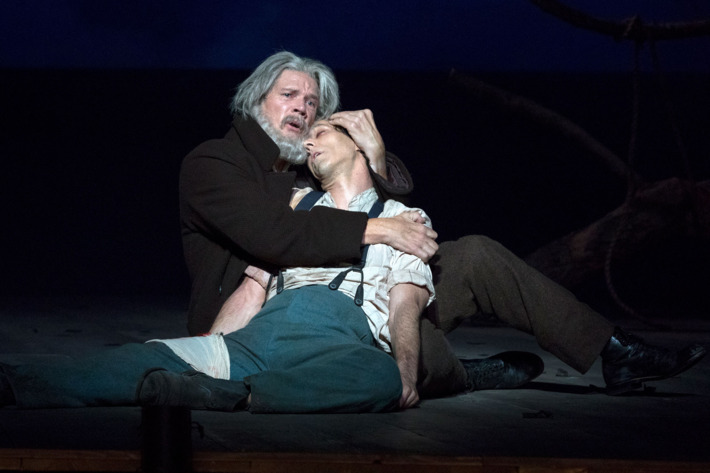 Baritone Rodney Gilfry gives the character an almost saintly depth, mixing mournful tenderness and wrenching self-doubt. His most potent bond is with John Wormley, a Confederate deserter disguised in shredded Union blue, a role that Alexander Lewis sings with wondrous fervor. Aucoin’s musical language is confident, yet shot through with intimations of future adventure. He has made efficient use of some of opera’s stock ingredients: drawn-out, tuneful deaths; romance amid the rubble; the revelation of a betrayal; a messenger arriving with a bolt of news (the end of the war); the flickering shift in focus from panoramic chorus to close-up aria. He has also learned from John Adams how to thread long vocal lines through a lush and sparkling tapestry of patterns, though Aucoin flits rapidly away from a moment that Adams might stretch out for a good ten minutes. Whitman juxtaposed somberness and sparkle in his wartime verse (“By the bivouac’s fitful flame, / A procession winding around me, solemn and sweet and slow …”) and in Aucoin’s score, too, singers tread lugubriously between passages of sparkling orchestral activity, so that the opera feels like it’s moving slow and fast at the same time. Director Diane Paulus has given Crossing a fine crepuscular frame, a hastily built hospital full of shadows and pain. But like many operas, Aucoin’s work is so dramatically static, so much more preoccupied with getting the music out to the audience than with the way characters relate to each other, that it barely needs a staging at all. Aucoin has surely studied Benjamin Britten’s War Requiem, that great poet’s report from the front lines, garlanded with a colorful orchestra. Britten’s is a concert piece, and in a way so is Crossing. Line up all the singers on the lip of the stage, place the chorus behind the orchestra, and you’d strip away very little of the work’s psychological drama. Rich as the score is, over its 100-minute intermissionless span, the pacing winds up feeling unvaried and glum. The virtually all-male cast gives the piece’s sound a uniformly dark sobriety and heaviness. When soprano Jennifer Zetlan darts onstage, bringing news from the outside world, she parts the gloom for the space of a quick aria. Perhaps she is an envoy from another, more playful version of Aucoin, who by now may well have leapt beyond the opera that made his name. If so, he may have moved closer to the spirit of Van der Aa, who in Blank Out tackles trauma with the nimbleness of a born entertainer. It opens with an unnamed Woman, sung by soprano Miah Persson, standing onstage, uttering fragmentary phrases — one slender voice alone against the void. Soon, we see the Woman doubled by a filmed version of herself singing onscreen. Then a third alter ego joins in, producing three-part polyphony. The counterpoint thickens, evolving into an expressive recitative supported by a quilt of electronic sound that eventually breaks into an aggressive dance beat. Van der Aa seems to be recapitulating the whole history of Western music from monophonic chant through vocal polyphony to early opera. Far from blotting out live musicians, Blank Out depends on the live presence of Persson, who plays with a scale model of the house she once lived in, while a camera follows her and projects her perceptions onto a movie screen. The audience takes this all in while wearing 3-D glasses, for reasons that soon come clear. Baritone Roderick Williams appears onscreen, remembering the death of his mother — the woman who strides across the stage in front of us but who (we now understand) must be a kind of ghost. Suddenly, the 3-D technology has a purpose: The live woman and filmed man both glimmer in the space before us, competing to seem more palpable than the other. The two pass a strip of rough cloth from stage to screen and run it like film through a pair of projectors, one present in steel and plastic, the other only in light. The woman crouches near the screen as if she has merged with the projections of her own mind. This apparatus might have devolved into a tech-obsessed sideshow, but Van der Aa is an inventive composer who is also dazzlingly in control of his multiple media. For a while it becomes almost impossible to distinguish flesh from light, reality from memory, now from then. Though a chorus and electronic orchestra are all prerecorded, I kept looking around to see if they were lurking in some corner of the Armory’s darkened Drill Hall. The whole scene becomes an exhilarating hallucination. By comparison, Berger’s My Lai feels predictable and heavy-handed. The libretto by Harriet Scott Chessman centers on Hugh Thompson, the helicopter pilot who put a stop to the butchery that U.S. soldiers were inflicting on Vietnamese villagers on that shameful day in 1968. Berger’s version of Thompson, as embodied by Eckert, paces around a hospital room, raging at the cancer that will soon kill him as well as the moral cancer that haunts his memories. He quivers with high-register wistfulness and fury. “I always wanted to fly, rise up like a bird,” he sings, soaring into falsetto range. A moment later, he barks out recognition of the horrors taking place just below his landing gear. The quartet produces dissonant shudders; the Vietnamese string and percussion instruments contributes some local color. In interviews and speeches, the real Thompson comes across as a reticent and phlegmatic soldier, and yet his monotone narration delivers a far more potent payload of drama than Berger’s jumpy cross-cultural score. In the end, an operatic experience depends not on mapping the genre’s borders, but on musical inventiveness, an old-fashioned virtue that makes all other components fall satisfyingly into place. Crossing is at BAM through October 8. 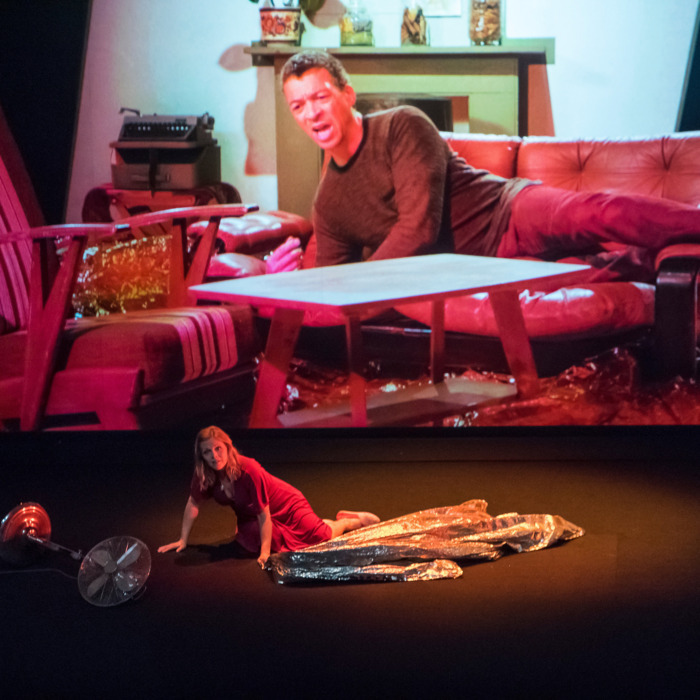 My Lai (also at BAM) and Blank Out (at the Park Avenue Armory) have completed their runs.